Trussed Rafters (or Roof Trusses) are specified for over 90% of roofs for housing in Ireland today. Since the punched metal plated trussed rafter was invented in 1952 in Florida USA, they have revolutionised the house building industry worldwide. 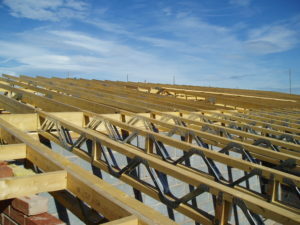 The trussed rafter is an individually designed component, engineered to provide a structural frame for the support of roof or similar structures and have proven to be an efficient, safe and economical method for supporting roofs since their introduction into the UK in 1964, and Ireland in 1968. With the increasing power of computer technology, Trussed Rafters are now revolutionising the greater construction industry providing engineered solutions for ever larger and more complex building projects. Only specialised timber engineering companies can manufacture and CE mark Trussed Rafters, and must be independently monitored by a recognised ‘Notified Body’, such as the NSAI. Increasingly – RiR – Room in the Roof or Attic trusses are being specified on projects of all sizes, providing an extremely cost effective way of enlarging the overall floor area of a property, while maintaining the original footprint of the building. While there are some limitations as to what can be achieved, this method of utilising the space in the roof is some 5 times faster to construct than using the traditional cut method, (see “Attic Do’s and Don’ts” – Note:- the rules outlined here would also refer to roofs utilising Raised Tie trussed rafters). If this additional space is not to be used immediately, the requirements of SR 70 Clause 13.2 Design for future alterations and changes of use, should be taken into account. In addition, where this option is considered in a roof over a two storey dwelling, the Building Regulations Part B Fire and Part K Stairways in particular, should be consulted to ensure compliance. 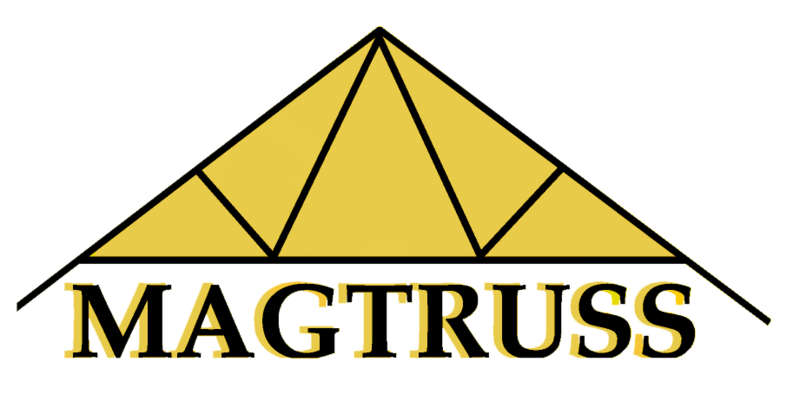 Our team at Magtruss Ltd are experienced specialists in roof and floor component design and manufacture, and are therefore ideally placed to assist in achieving affordable, precisely engineered solutions throughout all sectors of the building industry. The pitch range of trusses is generally 22.5° to 45°, however lower and higher pitches can be achieved*. * It should be noted however, that both low pitch and high pitch roofs are more susceptible to the effects of wind forces and may have a marked effect on the superstructure. Metal web (or Open web) joists, Easi-Joists® are a relatively new product to the Irish and UK markets which utilise the combined strength properties of timber and steel to produce an extremely strong and very light weight engineered solution for floor joists. Magtruss Ltd were at the forefront of bringing this technology to market and were the first manufacturer in Ireland to produce Easi-Joists®. Working with our engineering partners Wolf Systems Ltd and the Irish Agrément Board (IAB) in developing this product for the Irish market, achieving certification in 2007, IAB cert No 07/0280. Easi-Joist® has since gone on to attain European Technical Approval and holds an ETA-07/0032. Our Easi-Joist® production is fully certified by the NSAI and CE marked to comply with the latest Building Regulations. The use of Easi-Joist® has significantly increased in popularity in Ireland since their introduction. Clients who have switched to Easi-Joist®, would not now go back to using traditional solid timber joists. Not only does Easi-Joist® outperform solid sawn timber in span and dimensional stability, the added benefits of a greater bearing area and the open web system, make them easier to install for the carpenter. The follow-on trades like plumbers’ and electricians’ work and time on site is reduced considerably, due to the ease with which their pipes and wiring can be installed in the voids in the joists, reducing valuable time and cost and eliminating the need for notching or drilling.